Priscilla Presley (ex-Jenna) has a new children's book, "Elvis Presley's Love Me Tender." The show was canceled, but they're trying to find a new network to pick them up! Please vote for Jordana Brewster (Elena) for Favorite Actress in a New TV Series at http://vote.peopleschoice.com/. Join the Save Dallas Marathon on Facebook & Twitter on October 13. TNT’s ‘Dallas’ season 3 debate: Is it airing on the wrong night? The Ewings, television's first family of bad, will celebrate the season three premiere of TNT's hit series Dallas the only way they know how: big and bold. The Ewings are set to take over a gas station, slashing prices for one day only. The flagship station – with a location that will be kept secret until Monday, Feb. 24, at 8 a.m. (ET) – will be branded Ewing Energies. Dallas fans will learn about the one-day event through a multi-media campaign. Season three of Dallas will launch Monday, Feb. 24, at 9 p.m. (ET/PT). The Ewings like to do everything on a Texas-sized scale, so their gas prices will undercut the competition while supplies last. The Dallas gas station takeover campaign will feature a New York Times ad announcing the price cut, radio promotions, billboards, wrapped oil tankers and special video messages by John Ross Ewing (played by Josh Henderson) on Facebook. The Ewings have thought of everyone, too. For those not near the flagship station, TNT will run a sweepstakes via the Dallas Facebook page, where fans have the chance to win a custom Black Gold Card with a $50 balance. "There's no better way to celebrate the return of Dallas than with a promotion that is Texas-sized and audacious," said Tricia Melton, senior vice president of entertainment marketing and branding for TNT, TBS and Turner Classic Movies (TCM). "We're excited about unveiling the surprise location of Ewing Energies." "Producing a campaign for TNT that effectively showcases how the world's most powerful fictional family, the Ewings, can blur the lines and wield enough power to change something in the real world is the type of work that Grey lives and breathes for," said Lisa Topol, executive creative director at Grey New York, the agency working with TNT on the activation. "Fans will just have to wait and see how generous the Ewings will be with the final price of gas." TNT's hit series Dallas follows the internal and external conflicts facing the wealthy Ewing family. The drama stars Jesse Metcalfe, Josh Henderson, Jordana Brewster, Julie Gonzalo, Brenda Strong, Mitch Pileggi and Emma Bell, with Patrick Duffy and Linda Gray. Season three of Dallas will also see the addition of Juan Pablo Di Pace as a regular cast member and the return of guest stars Ken Kercheval, Judith Light, Kuno Becker and Marlene Forte. In addition, AnnaLynne McCord is set to guest-star in several episodes. Dallas, which is produced for TNT by Warner Horizon Television, premiered in 2012 and finished the year as one of basic cable's Top 10 new dramas. In its second season, Dallas drew more than 3.8 million viewers, with 1.7 million adults 25-54. Shot on location in the title city, Dallas was developed by executive producer Cynthia Cidre from the series created by David Jacobs. Serving as executive producers with Cidre are Michael M. Robin, Robert Rovner and Bruce Rasmussen. TNT is television's destination for drama. Seen in 101 million households and ranking among cable's top networks, TNT is home to such original drama series as Rizzoli & Isles, Major Crimes, Falling Skies, Perception, Dallas and Franklin & Bash. TNT's upcoming slate of scripted dramas includes the original series Legends, The Last Ship and Murder in the First, as well as Transporter The Series, which will make its U.S. television debut on the network this fall. TNT also features dramatic unscripted originals like Cold Justice, Boston's Finest, Marshal Law: Texas, APB with Troy Dunn and the upcoming Private Lives of Nashville Wives, Save Our Business, Inside Job, On the Menu (working title), Wake Up Call (working title) and Life Flight. In addition, TNT is the cable home to popular dramas like Hawaii Five-0, Castle, The Mentalist, Bones and Supernatural; primetime specials, such as the Screen Actors Guild Awards®; blockbuster movies; and championship sports coverage, including NASCAR, the NBA and the NCAA Division I Men's Basketball Championship. TNT's Dallas stars Patrick Duffy as Bobby Ewing, who is now the senior member of the Ewing family following the death of his older brother, J.R. Ewing. Linda Gray stars as Sue Ellen Ewing, J.R.'s former wife and the mother of his son, John Ross, played by Josh Henderson. Following the death of his revered father, John Ross is out to prove he can be just as powerful an ally or enemy as his infamous father. Jesse Metcalfe is Christopher, Bobby's adopted son who is newly single and determined to make a name for himself and his family in the world of natural gas. Jordana Brewster is Elena Ramos, John Ross and Christopher’s former girlfriend who is now blinded by thoughts of justice for previous wrongs. Julie Gonzalo is Pamela Rebecca Barnes, John Ross' wife and the daughter of Cliff Barnes (Ken Kercheval), a longtime rival of the Ewings. She is determined to have a happy ending with her husband and make a home on Southfork Ranch. Brenda Strong stars as Bobby’s wife, Ann, while Mitch Pileggi stars as Harris Ryland, her scheming ex-husband. The ensemble cast also includes Emma Bell as Emma Ryland, a sheltered beauty whose father has taught her to distrust the world around her, and Kuno Becker as Drew Ramos, Elena’s troubled brother. And guest star Judith Light is set to return as Judith Ryland. 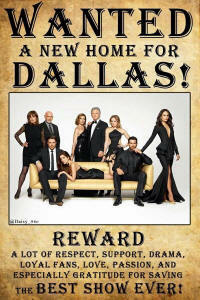 Dallas drew more than 3.8 million viewers in its second season, with 1.7 million adults 25-54. Shot on location in the title city, Dallas is produced for TNT by Warner Horizon Television, with Cynthia Cidre, Michael M. Robin, Robert Rovner and Bruce Rasmussen serving as executive producers. Dallas is based on the series created by David Jacobs. A Holiday Message from the Ewings! The backstabbing, two-timing, double-crossing drama of TNT's Dallas is slated to kick off its third season Monday, Feb. 24, at 9 p.m. (ET/PT). And TNT has the perfect binge-watching opportunity for viewers leading into it: a 25-hour marathon of Seasons 1 & 2. TNT's pre-season-premiere Dallas marathon will begin Sunday, Feb. 23, at 8 p.m. (ET/PT) and run straight through until the premiere of the new season the following night. The marathon will also feature a social media component, with various fan and character tweets featured throughout each episode. Additional content will be available through the Dallas Facebook page, narrated by John Ross Ewing. Dallas premiered in 2012 and finished the year as one of basic cable's Top 10 new dramas. In its second season, Dallas drew more than 3.8 million viewers, with 1.7 million adults 25-54. Shot on location in the title city, Dallas was developed by executive producer Cynthia Cidre from the series created by David Jacobs. Serving as executive producers with Cidre are Michael M. Robin, Robert Rovner and Bruce Rasmussen. AnnaLynne McCord (90210, Nip/Tuck) is set for a multiple-episode guest-starring role on TNT's hit series Dallas, which is slated to return for its third season this winter. McCord, most recently seen as Naomi Clark on 90210, will play Heather, a 20-something ranch hand with a troubled ex-husband and a 5-year-old son. Having grown up in a house with four brothers, Heather is quite capable of handling herself around the Southfork ranch hands, but when her ex-husband returns, bringing turmoil back into her life, Christopher steps in, helping Heather resolve the conflict, and the two become involved in a romantic relationship. McCord is represented by Alchemy Management. Need a refresher course on how the Ewings of DALLAS became so bad? TNT has released a new video that recaps their colorful history and catches you up on what's been happening in the 20 years since we've last seen them. Find out all you need to know about the Ewings - the back-stabs, secrets and betrayals - from the beginning.